How Much Good Are Public School Dress Codes Actually Doing? Public school dress codes have become incredibly unreasonable and even sexist. Sure, dress codes do an important job. They stop students from dressing in a way that distracts other students. I completely understand that a student should not be able to show up to school with hardly any material on his/her body, but I think stopping a student from showing her collarbones is just a little excessive. Stephanie Hughes was sent home for wearing a shirt that exposed her collarbone. “Collarbones?” you say. Yes, collarbones. Yahoo! Parenting reports that in August, Stephanie Hughes, senior, was sent home for wearing a tank top with a cardigan and jeans. 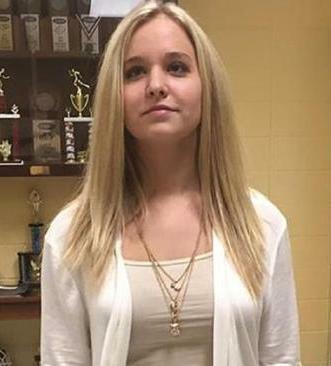 Her school, Woodford County High School in Kentucky, decided that her collarbone was such a distraction to her fellow students that she just had to be sent home. Her mother, Staccie Dunn, picked her up. Yahoo! Parenting also reports that this past school year, Carey Burgess, student body president of her high school, wore a skirt that fell about three inches above her knee. Her school, Beaufort High School in South Carolina, also sent her home. 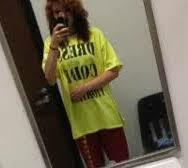 Miranda Larkin was forced to wear the “Dress Code Violation” shirt because her skirt was four inches above the knee. These girls are only two of many. There’s also Miranda Larkin who, according to the Washington Post, was told to change into a neon yellow shirt with the words “Dress Code Violation” written on it, because she wore a skirt four inches above the knee. Imagine how humiliated she felt! The list could go on and on. Obviously, these dress codes have failed at doing their “job,” preventing a distraction to students’ education. They’ve actually managed to make more of a distraction. At least, that’s what I would call sending a student home – a distraction. Instead, these dress codes have accomplished their unspoken job, objectifying girls. A girl’s collarbone or thigh is not an inherently showy or inappropriate part of her body. If you think collarbones are inappropriate, it’s because strict dress codes misrepresent collarbones as being potentially sexual. Besides that reason, what exactly would make a collarbone inappropriate? That’s right, nothing. A young girl should not have to be careful about her clothing choices because you have managed to sexualize her nonsexual body parts. Carey Burgess got sent home for wearing a skirt that was deemed “too short”. Instead of setting ridiculous standards for girls, schools should teach their male students to respect their female students regardless of how much skin they show. What could be worse than schools objectifying their young students? Schools only objectifying their female students. M-A Bears News, Menlo-Atherton High School’s school newspaper, reports a study that shows 64% of girls being called out for dress code violations and only 12% of boys. This study was conducted by the school’s feminist club. If schools are going to objectify their students, they could at least do it in a consistent way. School dress codes also have a gender bias in that they value a male’s education over a female’s. When a girl is sent home for a dress code violation, it is for the sake of a boy’s education; that is, the supposed distraction from his studies that the female collarbone would present. However, the girl that is sent home misses a whole day of class. Why is it perfectly fine to disrupt a girl’s education for the sake of a boy’s? Whether schools realize it or not, they relay the message that the education of male students is more important to them than the education of female students. Talk about sexism. If schools really want their students to dress reasonably, they should set the example. Make your dress codes reasonable (oh, and not sexist, too)!